Big fish often play a big part in deciding the individual outcome of a canal match. Chub, carp, bream and even big perch are often needed to boost a catch of smaller fish and get you into the frame. But you must use the right tackle. Bream aren’t hard-fighting fish and generally can be landed fairly comfortably on the lightest of gear. Chub, carp and big perch are a very different proposition, however — use inadequate tackle for these fish and they usually smash you every time. 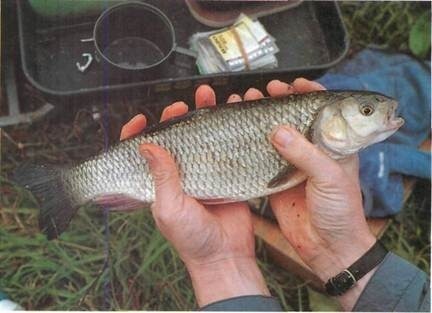 Chub are common in many of our canals and can be caught at all sizes from a few ounces to several pounds. As in rivers, they love a bit of cover over their heads and favoured pegs usually have obvious features on the far bank. The pole is the best way to prise them out – so long as you have the end gear and elastic to cope. When fishing a feature peg with the pole you need to feed more heavily for fish like carp than for, say, roach. Feed slightly away from the feature to start with to try to draw the fish out of their cover. The great thing about the long pole is that it allows you to place your bait with pinpoint accuracy and hold it dead still. But your pole must be very stiff and strong to stop big fish on their first run. 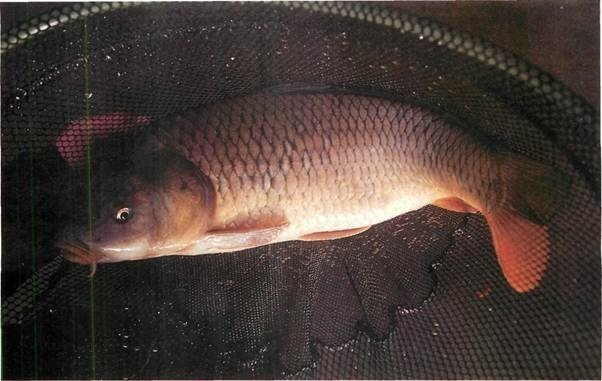 Sometimes, wily and wary big fish like carp and chub refuse to be drawn out of their snaggy far bank lairs – especially in summer, when boat traffic is busy, and even more so in a match, when bankside disturbance is inevitable. When this is the case you have no choice but to go in there after them. To minimize the risk of tangling with dangling branches, keep the line between float and pole tip as short as you can – as little as 45cm (18in). 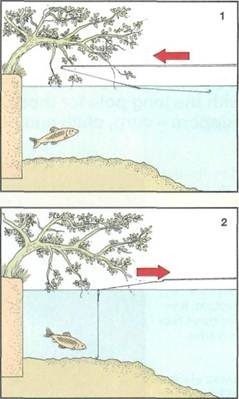 To get your bait into position, thread the tip of the pole between the branches as carefully as you can (1). Withdraw it with equal care to leave the float in place (2). When you get a bite, strike by pulling the pole towards you. Don’t strike upwards, whatever you do! A common nestles safely in the landing net, and a place in the frame is as good as assured. 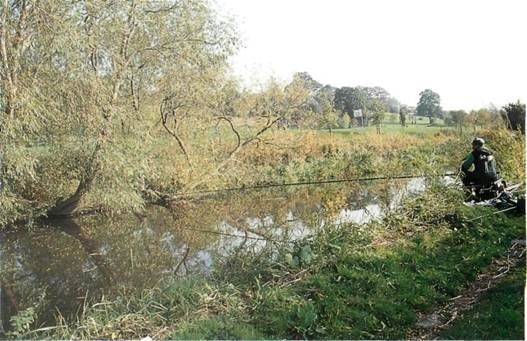 Some anglers say carp ruin canal matches by making them peggy and rewarding the luck of the draw – but if you are bold enough to go for them and skilful enough to land them, why shouldn’t you collect the spoils?There is no room for error with such fish. You must get everything right, from feeding the swim to choosing the right hook, lines and elastic. When big fish won’t play ball and you can’t lure them out of their lairs you have to resort to ‘suiciding’ -going in after them. You must gain the upper hand as soon as you hook one -beefy gear is essential to drag the fish out into the open. Good pegs for big fish are almost always immediately recognizable. Most have a distinct feature on the far side, whether it be an overhanging bush or tree with branches trailing in the water, a permanently moored boat, an old sunken barge, or a reed or weed bed. The best feature-pegs also get pleasure fished the most, so if you draw one where the towpath is particularly well worn you can be sure you are on a potential flier. Big fish like plenty of cover over their heads, and can be very reluctant to leave their snaggy sanctuaries. But it is fatal to feed straight into their cover – do that and they will never come out. 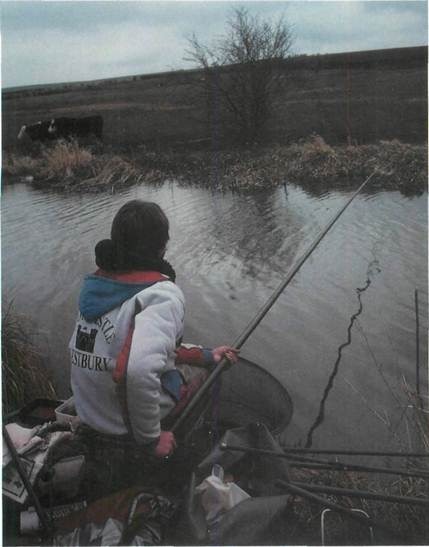 Always start by feeding slightly short of it, or to one side, to try to draw the fish out into the open, where you have a much greater chance of landing them. Only if this fails and they refuse to come out should you resort to ‘suiciding’ – dropping your hook-bait right into their lair. On the subject of baits, generally speaking casters and red and bronze maggots are best – but it nearly always pays to feed some hemp as well. And remember – big fish can eat a lot of bait very quickly, so you usually need to feed much more heavily than for, say, roach. Big hookbaits such as double and treble caster or maggot are normally the order of the day. Short-lining with a long pole is the best method because it allows you to put your bait exactly where you want it, and hold if there. If the canal is too wide for your pole or there is a very strong crosswind, the straight lead is generally a better option than the waggler. 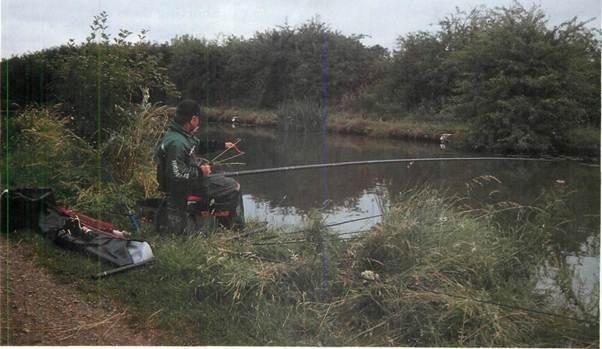 Even when there is no wind it is very hard to present a completely still bait with a waggler because of the drift and tow you get on most canals – especially in summer when there are lots of boats about and locks are in constant use. A soft, lightweight pole is no use at all You need one that is stiff and strong, especially along its top two or three sections, so you can exert maximum leverage on a fish to stop it in its tracks. Correct choice of elastic is essential. A times you cannot give the fish as much as an inch – if you do, they are home, well bedded among tree roots, in a reed bed or behind a boat. In situations like this you need No.7 or No.8 elastic, through two sections, and tightened to such an extent that it hardly comes out of the pole at all. This enables you to put great pressure on the fish and pull it clear of danger. For less snaggy swims, and fish up to only 2lb (0.9kg) or so, you risk pulling the hook out with such tight and heavy elastic. Instead, use No.5 or No.6 elastic, through two sections, and not over-tightened. A dibber is the best float for shallow far bank swims. 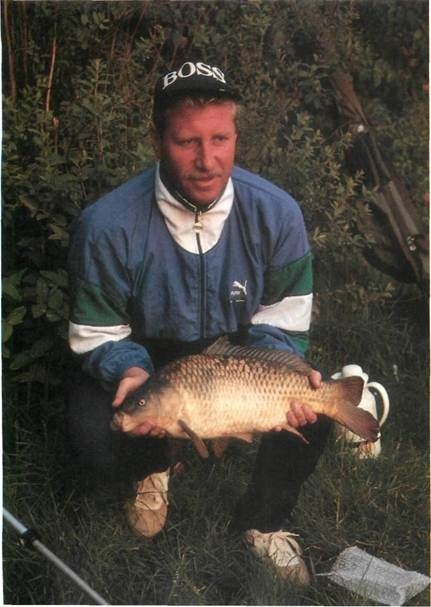 Go for one with a bright fluorescent top, so you can see it under the water as the bite develops and the fish takes off. Knowing which direction the taking fish is going is essential, so that you can strike successfully against its run. In coloured water it pays to use a float with the whole body painted a fluorescent colour, and not just the top. Don’t go lighter than a 2lb (0.9kg) main line and a 0.68kg hooklength. For ‘suiciding and carp weighing more than about 2/4lb (1.1kg) you often need to go up to a main line of 4lb (1.8kg) and a hooklength of 3lb (1.4kg). This is no place to take chances with high-tech lines – stick to a tough, tried and tested line such as Maxima. Strong forged hooks that won’t open out under pressure are essential -match the size to the bait. When fishing the straight lead, a simple 2SSG paternoster suffices, with a 5-10cm (2-4in) link and 30cm (12in) tail. When you are unable to draw the fish out of their cover you have no choice but to go in after them. It is now you have to be very careful indeed. Usually you can only penetrate their cover with a very short line from the tip of your pole to the float – sometimes as little as 45cm (18in). Any more and you cannot thread the float into the undergrowth without tangling up . Get a bite now and the outcome is largely a matter of luck. Quickly shipping back the pole results in one of two things – either a lost ‘tree climbing’ fish or one successfully manoeuvred into open water. Once you steer the fish clear you are usually home and dry. An important point here – if the top two or three sections of your pole are take-apart, not telescopic, secure the joints firmly with electrical tape. If you don’t, you can lose the lot as the pole goes one way and the fish decides to go the other. One thing you cannot avoid losing sometimes when ‘suiciding’ is your rig, so cheap home-made floats are best – you won’t feel as bad about losing one as you would an expensive shop-bought float. Although you should always turn up to a match prepared for big fish, there are times when going after them is a mistake. The conditions might be all wrong – the water too cold and clear, for example. Or the nature of the swim might make it impossible. For instance, the fish might be in a band of water between a weedbed and the far bank. It’s very unlikely that you will be able to tempt them to feed on your side of the weedbed, and should you hook a big fish on the far side of the weed your chances of landing it are very, very slim. Also, if you are happily catching small fish such as roach your best bet is usually to carry on as you are and not feed so heavily as to entice a big fish into your peg- because once a big fish does move in, the small fish invariably move out. Hook and lose that big fish and the commotion could ruin your swim for the day. There is no room for compromise with big fish on canals. If you spot one moving in your swim, or see a tell-tale cloud of silt or trail of bubbles, you have to make a crunch decision whether to go for it. Land it and you are a match winner; lose it and, well, that’s it. But nothing gets the adrenalin going more than spotting a big fish, seeing your float disappear and knowing you have the gear to cope with what could prove the match winning fish.